Book Your Educational Farm Tour! Secure your spot today by using our online booking tool! 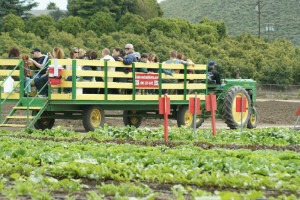 Educational Farm Tours can be one or any combination of either a strawberry, vegetable, or a pumpkin picking tour (where everyone will pick either a 1lb basket of strawberries, a bag of assorted veggies, or a sugar baby pumpkin to take home), or an Animal Ed-Venture Tour that includes an animal presentation and animal feeding. All tours feature an educational presentation from the farmer, a vintage tractor drawn wagon ride around the farm, a shaded picnic area to enjoy your snacks or sack lunch, a visit to our Farm Animal Center, and a farm activity coloring book for every child.The tractor-drawn wagon ride then takes the tour group into the fields. Combinations of one, two, or all three tours are available when in season at $8 / $12 / $14 per person (children & parents), Teachers and Aides are FREE! Home school groups click here. There is a minimum price for each tour based on 20 participants. Approx. 2 ½ - 4 ½ hours including picnic and Farm Animal Center. 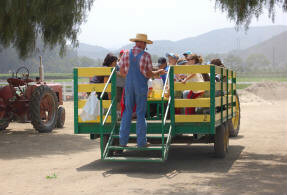 1) Country Classroom Strawberry Tour ($8): includes a 1lb basket of strawberries. 2) Country Classroom Vegetable Tour ($8): includes a bag of assorted vegetables. 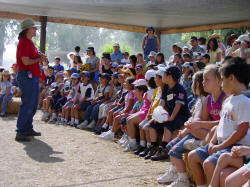 3) Animal Ed-Venture Tour ($8): includes an animal presentation and animal feeding. 4) Berry/Veggie Combo Tour ($12): includes a 1lb basket of strawberries and a bag of assorted vegetables. 5) Berry/Animal Combo Tour ($12): includes a 1lb basket of strawberries, an animal presentation & animal feeding. 6) Veggie/Animal Combo Tour ($12): includes a bag of assorted vegetables, an animal presentation & animal feeding. 7) Veggie/Pumpkin Combo Tour ($12): includes a bag of assorted vegetables and a sugarbaby pumpkin. 8) Animal/Pumpkin Combo Tour ($12): includes an animal presentation, animal feeding and a sugarbaby pumpkin. 9) Berry/Veggie/Animal Combo Tour ($14): includes a 1lb basket of strawberries, a bag of assorted vegetables, an animal presentation and animal feeding. 10) Veggie/Pumpkin/Animal Combo Tour ($14): includes a bag of assorted vegetables, a sugarbaby pumpkin, an animal presentation and animal feeding. *To ensure that your trip to Underwood Family Farms is FUN and relaxing, please see our tour guidelines so that you will be prepared before your arrival. Also, please take note that all prices are subject to change without notice. To book your tour, click on the Book Now! link above or if you require additional information, call the farm at (805) 523-8552.